this one definitely still needs some work - a few more hanging picture frames, some other odds & ends for the top shelf & I need to get that W painted, for sure - but it's been fun to play with nonetheless! 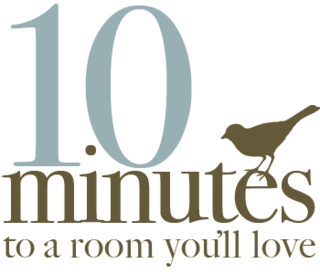 Head on over to the Nesting Place & check out other great 10 minute spruce-ups!! edited to add: this is the top of our armoire @ night...we used an extra strand of Christmas lights up on top, so it gives off a nice glow and makes the display even more homey and enjoyable! Love it!! Thanks Nester for encouragement in the right direction! !